If you formed this way you’d be weird too. Our Moon is really weird. I mean that literally. It has a lot of physical qualities that are pretty hard to explain. For example: It’s big, fully a quarter the diameter of the Earth. Excluding Pluto and Charon, it’s the highest known ratio of moon to parent body size for any large object in the solar system. There’s more. All other moons in the solar system orbit over their parent planet’s equator. 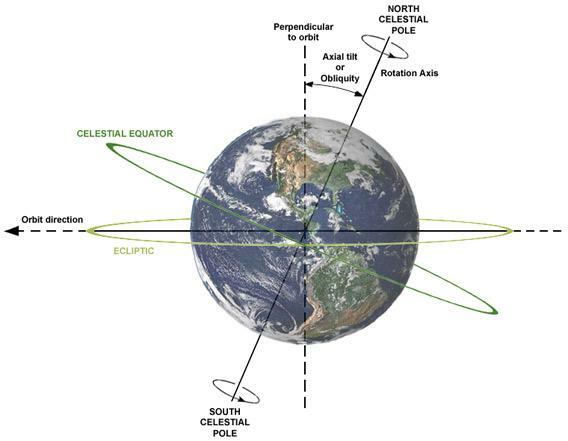 Our Moon’s orbit is tipped by much more; it actually is tipped 5° to the Earth’s orbital plane around the Sun; the Earth itself is tipped by 23° to that. * Also weirdly, while there are some differences, overall its composition is similar to Earth’s. That’s unusual too; most moons are way different than their planets. A lot of these problems with our Moon were solved when the Giant Impact hypothesis was proposed. Early on in the solar system, a disk of material orbited the Sun, and it was from this disk the planets formed. Small bodies condensed out of it, collided, and grew to become the planets. At some point, tens of millions of years after it initially formed, the Earth was whacked by a Mars-size object at a glancing angle. This flung a huge amount of material into space, which formed a disk over Earth’s equator. The Moon coalesced from this ejecta, and the Earth was left spinning rapidly, with a day just five hours long. Over time, interactions between the Earth and Moon slowed our spin and moved the Moon out, away from the Earth to where we see it now. That explains a lot of the weirdness we see from the Moon; its unusual size is due to the large amount of material blasted into space, for example. But there are problems. If the Moon formed over the equator, why is its orbit tipped by so much now? Also, in the impact models, the Moon should have a lot of material from the impactor, but instead is closer to an Earth-like composition. Why? A group of scientists think they may have found the answer. And as a bonus, it explains yet another odd thing: Why the Earth is tilted by 23° to its orbit. Can the Moon explain why the Earth’s tilt with respect to its orbital place (also called its obliquity) is so large? Maybe. What they propose is a modification to the giant impact idea. In their model, they have a much more energetic impact. The tremendous power of the collision set the Earth spinning with a two-hour day, faster than in the classic impact hypothesis. The higher energy also meant the material ejected mixed a lot more, so that both the Earth and Moon wound up with similar compositions. Then comes the really strange part. You know how a kid on a swing can make their arc go higher by pumping their legs? By doing that they transfer the energy of their legs’ motion into the swing. But they have to time it right to make it work, doing it at just the right time in the arc. When two cycles line up like this it’s a called a resonance, and it’s a huge influence on the motions of moons and other bodies. After the Moon formed, it started moving away from the Earth due to the complicated dance of gravity and tides. I explain how this works in Crash Course Astronomy: Tides, if you want the details. The outcome of this is that the Moon’s orbit slowly expanded and the Earth’s spin slowed. In the new model though, there’s a twist: The giant impact torqued the Earth hard, so much so that our planet’s pole was aimed more toward the Sun than it is now. This changes that tidal evolution of the Moon. As it moved away it went through a series of resonances, some connecting the way it moved away from Earth with the Earth’s motion around the Sun (like the way a kid’s legs connect with the swing’s motion). What the scientists found in their models is that this affected both the tilt of the Moon’s orbit as well as the tilt of the Earth itself. As the Moon’s orbit expanded, it also moved around, changing its orientation. The Moon’s tides tugged on the Earth all that time, eventually yanking the Earth closer to being upright (the Earth’s orbit was unaffected, though). The Sun is off to the left, and the Earth’s axis points near it. As time goes on (starting less than a million years after the impact) the Moon’s orbit changes in orientation, tilt, and shape, and the Earth’s axis changes, too. I’ve left out a lot of details because they’re complicated and would take a lot to explain (feel free to read the paper, but there’s a lot to it). Still, this is the meat of it. The big question is: Is this what actually happened 4.5 billion years or so ago? That’s a different question. Just because this new idea explains more stuff we see now doesn’t make it right. Lots of other ideas have come along, and no doubt more will. Perhaps this idea is correct, and still needs modification (for example, we know a lot of things happened after the Moon formed; its far side and near side are really different, and more hypotheses have been proposed to explain that). Maybe something better will come along that explains even more. But that’s science! 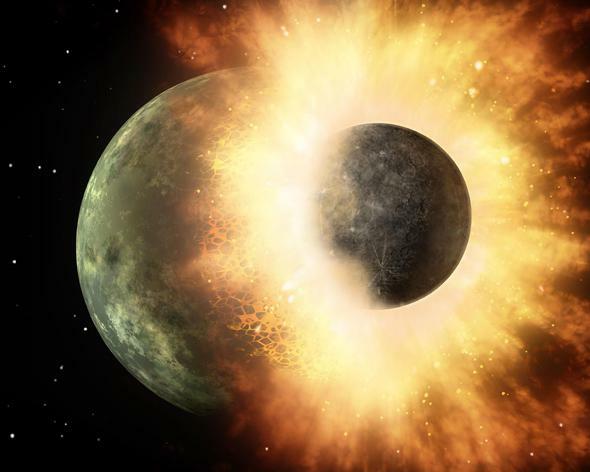 For a long time—centuries, millennia—we had no more than guesses on how the Moon formed. As we studied it more we learned more about it, and were able to cull a few hypotheses. Then we went there and got samples, pieces of the Moon we could study in the lab. More mysteries surfaced, and the giant impact idea explained a lot of them. But it’s been modified, over and again, tweaked here and there, and now we may very well be closing in on the complete history of how our gigantic satellite came to be. There are a lot of reasons I love science, but one of them is that it doesn’t flinch from telling the big stories, and welcomes changes to make the story better. *Correction, Dec. 1, 2016: I originally wrote that the Moon is tipped 5° to the Earth’s equator, not the Earth’s orbital plane.